Below are the latest points charts for the various Spedeworth formulae. Points are scored in ALL RACES, irrespective of starting positions, grades etc, including Championship races that may well be started with the highest point scorers at the front of the grid. Wherever possible, for Monthly graded formulas, points run to the last day of each month and come into force on the first day of each month. Points for any meetings run between the last Saturday in the month and the first Saturday of the following month, will count for the next points chart. Where grades are applicable, these will be calculated on points scored, with a careful eye being kept on a drivers previous racing history. You should ensure that you car is marked appropriately with you current grade as per your formula rules. If these are not marked correctly on your car, then you will be made to start at the back of the grid. If you are a Superstar, then you may fit flashing orange lights to the front visor of your car. Remember also that if you win a heat race during a meeting, you MUST start at the back of your grade for the remainder of the meeting. If you fail to do so, then you will be docked 2 places for every car that you have started ahead of. We will try to remind you when you are on the grid, but ultimately, it is the drivers' responsibility, so don't blame the track staff if both you and they forget!!! If you are lucky enough to win two races in one meeting, then you are automatically upgraded to the next grade up for the remainder of that grading period. This replaces the old "40 point rule", which now no longer exists. 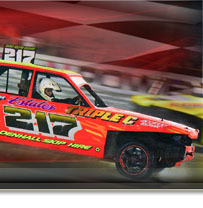 The Points charts for 1300cc Stock Cars, 2.0 Hot Rods, Stock Rods, Lightning Rods, Junior Bangers, Bangers, Superstox and National Bangers will run from WORLD FINAL to WORLD FINAL, i.e they will be zeroed at the World Final and then start again. All other formulas will run for the calendar year from 1st Jan to 31st December.